In 24 years of competition as an owner and driver in the NHRA’s Top Fuel category, Joe Amato has achieved immense success behind the wheel of a dragster as well as at the helm of a major corporation such as Keystone Automotive. No other competitor came from such a background and left so triumphantly in all aspects. He leaves a living legacy on the sport that he loves so much, and takes with him marvelous memories that he will cherish forever. His Midas-touch career began at the age of 14 when he saw his first drag race and said, “I want to do that”. From that simple viewpoint, Joe Amato parlayed an incredible business acumen into a lucrative NHRA career based on determination and grit. As a salute to his fans, Joe Amato wanted to say “Thanks.” Although he will never say good-bye to the sport he loves, the man from Moosic, Pa was determined to acknowledge the loyalty of the fans, which he gave as his primary motivation. His career spans from 1983 to 2001 and in that time he set drag racing records that are so far unparalleled in the 54-year history of the NHRA. 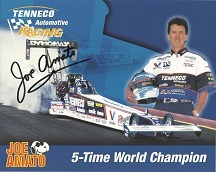 Joe Amato, 35 years of drag racing and then one day, it’s over. This is unique for you, isn’t it? “I guess when I woke up the next morning it was like what happened to the switch? I’m used to waking up and full speed with Amato Racing. Tomorrow is more or less unwinding everything and moving all the pieces of the puzzle to the next chapter. It’s been a great, great ride. Like all good things in life, sometimes you have to change the chapter. I have my health and now I’ll have the time and freedom to come to a few races and do what I want to do, but not be here and have the Monday to Friday obligation. What would you want to say to your fans for all their support over the years? “A lot of people came up to me this weekend and said thanks for the memories, but I think it’s been my pleasure to be able to perform in front of all the fans. Without the fans, this sport would be nothing. What supports that are the media, the sponsor people, and the NHRA. Over the years, that’s been the best part – the people, whether it’s the fans or the people involved in the sport and having the same denominator of competition. I have all the memories. Is there a particular fan you remember that stands out in your memory? Crew Chiefs — Tim Richards earned you five Top Fuel championships, what made that click so well? “I think to begin discussing that racing relationship you have to understand that we were friends, we’re from the same area, and we grew up together. Ray Laboski (personal racing friend) was a good friend of Tim’s and we ended up racing Alcohol together. At the time, Tim had his own Super Stock car, I wanted to go Alcohol Funny Car racing, and Tim decided to come with us and be the crew chief, building the engines for Ray and me. The three of us grew up together as sportsman racers and then later we transferred up to Top Fuel. Probably the biggest single mistake I made in my career was not staying involved with Timmy. We went through a transition period there while he was going through his divorce where we didn’t hang together and I would have probably had even more success with Tim. We’ve both been lucky and blessed. “The other thing with crew chiefs helping our team whether they are the Jimmy Procks and the guys, I guess, is that I gave them the ability to become crew chiefs or super crew chiefs, all the way to my current guys, the Dupuy boys (Wayne and Jimmy) who are both crew chiefs now. One was a crew chief when he got here and I gave them the budget and the whereabouts to become a top-five crew chief. There’s a big difference, you know. I felt I gave back in that respect. Is there one race that stands out in Joe Amato’s mind? Where does life take Joe Amato after drag racing now? “I still want to stay a part of racing. I’ll be back at Pomona next year. How I want to be part of it all is yet to unwind and who ends up where. However, I would like to stay included with a small part of a team or hang around with a couple of teams. I’ll see what develops. I’ve got many people that I’m friends with out here. I still would like to be able to contribute a little bit, if possible. I want to stay a part of mix when I want to come and if I want to come to 10 races, just pick the ten and I’ll spend the rest of my time traveling. Spend a little more time at home with my family and friends. You get used to doing it, but it’s still a lot of traveling. I hope the dog will get to see me a little bit more. Nevertheless, I have business stuff I am staying occupied in and I still do real estate and some things like developmental projects. I want to be able to kick back, slow down and smell the roses. I’ve always been full speed ahead on a treadmill all my life. If you could gather every Joe Amato fan and address them as a group, what would you say? During his two decades as one of Top Fuel’s most successful drivers, Joe Amato wasn’t the flashiest driver in the pits and he was seldom outspoken or controversial, but he did have an uncanny knack for finding the winner’s circle. From his early days in the Pro Comp class through his record five NHRA Winston Top Fuel championships, the affable and popular Pennsylvania businessman seemingly won at will. In addition to his five Winston titles, Amato’s résumé includes 52 victories in Top Fuel and another five behind the wheel of an alcohol-fueled dragster. 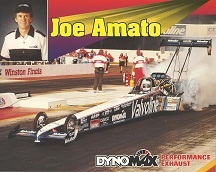 A longtime fan favorite due to his easygoing nature and willingness to interact with the public, Amato competed in 99 final rounds in Top Fuel and won the Budweiser Shootout at Pomona a record six times. He finished in the top 10 an incredible 19 straight years, from 1982 through his sudden retirement at the end of the 2000 campaign. 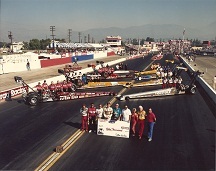 Amato’s success on the dragstrip was paralleled by his achievements in the boardroom. As president of Keystone Automotive Warehouse, he became one of the world’s largest distributors of high-performance automotive parts and accessories and was able to parlay that status into a number of successful long-term sponsorships. As a result, his racing efforts were never underfinanced. As were many of the sport’s stars, Amato was introduced to drag racing at an early age. He recalled the events that led him to his first event: “When I was 11, my father sold his deli and opened an auto parts store. Some of the guys who worked for my father would race on weekends, and they would take me with them to the track. I’ve been hooked on racing ever since. Five years after his father opened the auto parts store, Amato was faced with a monumental decision, one that would shape both his life and his career. His father was forced to quit working after undergoing open-heart surgery, and several of his employees left the company. At just 16, Amato chose to quit school to run the family business. His father never fully recovered and died four years later, leaving Amato to manage an expanding business that had grown to five stores specializing in speed accessories. Despite the heavy workload, Amato found time to race, and he soon realized that the more successful he was in racing, the more prosperous his business became. He campaigned a series of moderately successful Alcohol Funny Cars before switching to an Alcohol Dragster in 1979 and scoring his first NHRA national event victory, in Pro Comp at the Gatornationals in Florida. He scored again at the 1980 Le Grandnational-Molson in Canada, and in 1981, Amato enjoyed a breakthrough season, winning three national events. 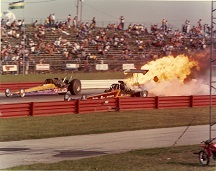 Buoyed by his success, Amato made the leap to Top Fuel in 1982. He did not reach a final round in his rookie season, but he did manage a respectable sixth-place finish in the points standings. A year later, he won three times and challenged Gary Beck for the Winston title. 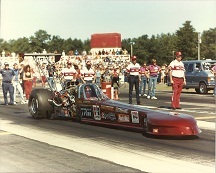 At the 1984 Gatornationals, Amato and longtime crew chief Tim Richards debuted a new chassis design that featured a number of major changes, the most obvious of which was a rear wing that was mounted higher and farther back from previous designs. 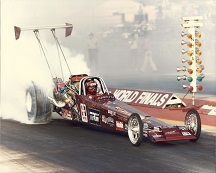 With that car, Amato became the first Top Fuel driver to eclipse the 260-mph mark. He also won three races during the season and captured his first Winston title. 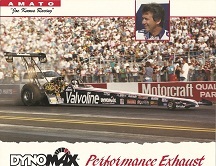 Amato made the sport’s first 280-mph run in 1987 and won the Winston championship again in 1988, but arguably his most successful season was 1990, when he won six national events, tying the NHRA record for most Top Fuel dragster victories in one season (since bettered by Gary Scelzi). 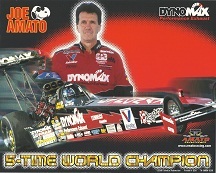 Amato continued his roll in 1991 and 1992, compiling eight more wins and winning his fourth and fifth Winston titles. Following a winless 1995 campaign, Amato slipped to 10th in the standings, but with new crew chief Jimmy Prock, he won 18 more titles from 1996 through 2000. 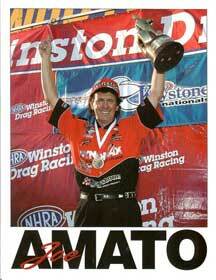 In addition, Amato continued to make drag racing history. He produced the sport’s first 4.5-second pass, 4.595, at the 1996 Western Auto Nationals in Topeka. Amato never experienced a bad crash in his career, but the thousands of runs he made eventually took their toll on his health. He suffered through chronic back pain in the latter years and decided to call it a career following the 2000 season after a detached retina began to interfere with his vision. Two weeks after undergoing laser eye surgery to correct the problem, Amato was back in the car and back in the winner’s circle, in Denver. 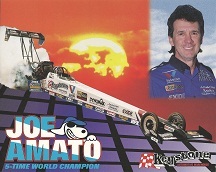 Amato’s final victory as a driver came at the 2000 Keystone Nationals at his home track, Maple Grove Raceway, and in front of a large number of friends and fans. 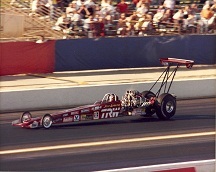 He had planned to host a Last Blast tour in 2001, but the persistent problems with his vision forced him out of the cockpit for good following the season-ending event in Pomona.